Trying to find something else altogether (the Spanish writer José Jiménez Lozano, on whom there’s almost nothing available in English), I happened on the entry Jindyworobak movement in my Merriam-Webster’s Encyclopedia of Literature; struck by the name, I did a little research and thought I’d post what I found. The movement was founded in 1938 by the poet Rex Ingamells (1913-1955), “in response to L.F. Giblin’s urging that poets in Australia should portray Australian nature and people as they are in Australia, not with the ‘European’ gaze.” It started as a literary club in Adelaide and emphasized the spirit of place and the importance of Aboriginal culture; you can read more about it here and (in the South Australian context) here (pdf; HTML cache here). 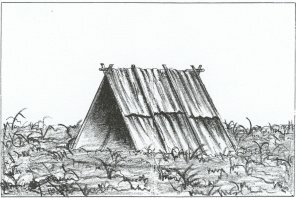 You can see a simple example of such a shelter here, and a more substantial one here. PS sometimes i still use a jindy word or two in my own poesy. it’s an Umbrist thing! From memory Woiwuru is the form of the name of the Melbourne language used in earlier studies. — Ah yes, and I find the Hercus word-list has only about 85 words from this language.